Coinciding with the 200th anniversary of LexisNexis, the 2018 LexisNexis Legal Awards acknowledges excellence across all areas within the legal sector. 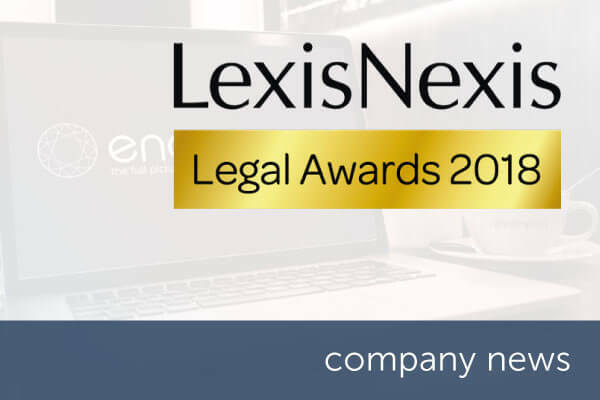 Launched in 2013, the LexisNexis Legal Awards commemorates achievements in legal innovation, and receive a high number of applications each year, all with exceptional standards of business delivery. The Award for Legal Supplier Innovation recognises a supplier that has brought forward new working practices within the legal centre through exciting innovation, which will in turn, have a huge effect on the future of legal practice. encompass has been shortlisted due to our ability to continually evolve our original technology-based ideas and provide a service which enables faster speed and quality of data for clients, which increases the efficiency and delivery of legal services. We are a trusted Know Your Customer (KYC) solution with real-time access to multiple sources of global company and person data. By using robotic search to automate the otherwise manual task of collecting global data to satisfy your KYC policy. encompass products deliver more efficient processes and faster regulatory compliance, resulting in lower costs and effective risk management. Wayne Johnson, Co-founder and CEO of encompass, said “We are delighted to have been shortlisted for the Award for Legal Supplier Innovation category at this year’s LexisNexis Legal Awards 2018. “We had spectacular growth in 2017, entering new markets and increasing our headcount all reflect our momentum, and we are continually working on our products to ensure our place as innovators within the legal-technology industry. This alongside some significant technology advances such as the recent launch of encompass remediate for performing KYC at scale and achieving global coverage of company ownership data.